No, friends, this is not an Impressionist painting. 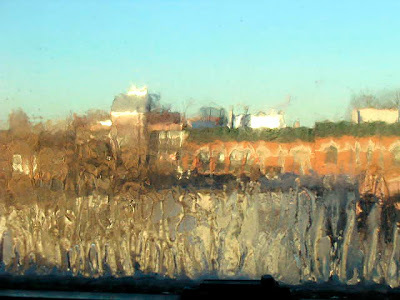 It is the ice which has formed on the inside of Pretty Lady's studio window. Cool. Perhaps not original or brilliant, but it fits. As well, who needs paint, sometimes, when a camera is so much swifter, if you are into such things. You honestly could work that up and frame it quite nicely. Just stopped by to catch up on my favorite artist, and, Pretty Lady (tm?). It must be rough being a woman. Clothing and styles, colors and fashion, ins and outs. Though men can and should show some style, be original and perhaps daring, our choices are quite slim in comparison. Though, some of us of the giant class find great difficulty even obtaining the finer things new, used... forgetaboutit. So, I have some jealousy toward your lot, and availability. Stay warm (you ought to be able to do so, and, if I may add, with taste). Stay well, you are a treasure. And have a spunky, successful, and bright new year. Oh, I remembered the song which I see you in, or is it, in you... Questions... Anyway, it is 'The Guest' by Leonard Cohen. In my dreams, you used to be mostly the hostess. But in these years, in my odd dreams, you seem to play both the hostess and the guest with equally impeccable and precise definition (as to the songs notions or intent). Well, I think I have something to do. Bye. I wasn't sure where to put this, so I am putting it on the comment form of this image that I like so much. I love your writing style. Have you had any books or anything published? and if you haven't why not? Yes, Doom, it is hard to buy for the Hill Giant. I think most clothing companies figure we can just order from the catalog because, after all, if we really cared how we looked, we'd be smaller. I gave up a long time ago on dressing halfway decently, not because I don't care, but because it's a hopeless cause. I've long envied women, especially women with the body shape to wear clothes off the rack. (My wife has almost as much trouble buying clothes as I do; female ogres aren't well-served these days either.) I've wanted to be one for a long time, or at least have one around I could dress. My girlfriend before I met my wife, she was a size 1. I bought all kinds of clothes for her when I could, but that was high school and I didn't have much to spend. Then again she had enough of her own; we dated for six months before I saw an outfit for the second time. My next girlfriend is going to be a clothes horse. Of course, I need to find a way to get rid of my future ex-wife first. And then I'm going to need to get a really high-paying job. And then...nah, too much effort. I can't be bothered to wonder if it's original or brilliant, because I do NOT care. It's breathtakingly lovely. How wonderful it is when life offers up these serendipitous bits of nature-made art. Oh, I wasn't discussing the picture's originality or brilliance, I was discussing the term "Cool". I don't think the picture could be anything but original, especially how it came to be. And if brilliant, it was in the 'author's' notion to combine this and that to produce it, which could easily be argued in the positive. No wonder I am despised. No one understands me, literally. No, that's not true. Even if they understood... Ha. Pretty Lady doesn't understand you people at all today, but she has vowed to quit whining about how cold her studio is. Ooops. Well, that's not the first time I've had a Reading Comprehension Issue here. heh! And Doom! Despise? Whyever would anyone do that? How perfectly silly. Sometimes I don't understand you either, but that certainly wouldn't make me despise you. I may be a bit puzzled, but I never minded that one bit in anyone. I'm glad you liked that pretty pic too. Pretty Lady may have been more focused on the evidence of Too Much Cold Around Here!! !, but lucky me, I can forget that bit and just enjoy the beautiful pic. Pretty Lady ALWAYS understands us today. Even when her studio is so cold her brain cells are freezing.